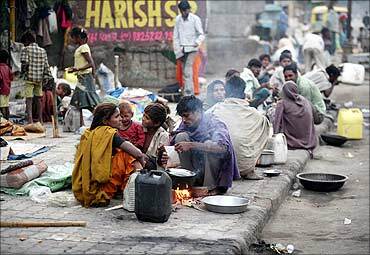 India has contributed to a large reduction in global poverty, according to the UN annual report on the Millennium Development Goals, which also pointed out that despite progress, the most vulnerable sections of society were being left out. 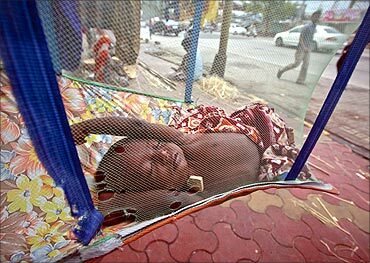 Image: Five-month-old Rahul sleeps in a hammock next to shop along a sidewalk in Mumbai. The report, which was released on Friday, said that poverty continues to decline in many countries and regions.It said that the fastest and sharpest reductions in poverty were in Eastern Asia particularly in China where the poverty rate is expected to fall under 5 per cent by 2015. 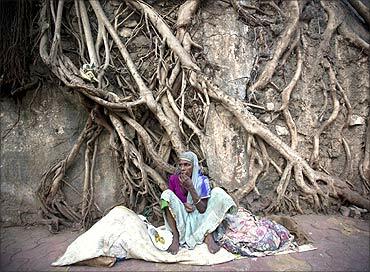 Image: A homeless woman sits in front of the dried roots of a banyan tree. 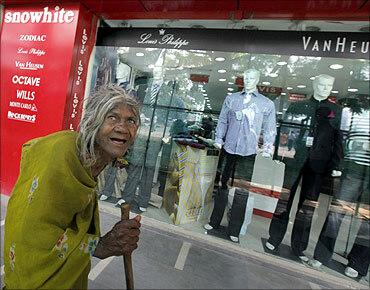 "India has also contributed to the large reduction in global poverty," the report said. "In that country, poverty rates are projected to fall from 51 per cent in 1990 to about 22 per cent in 2015." 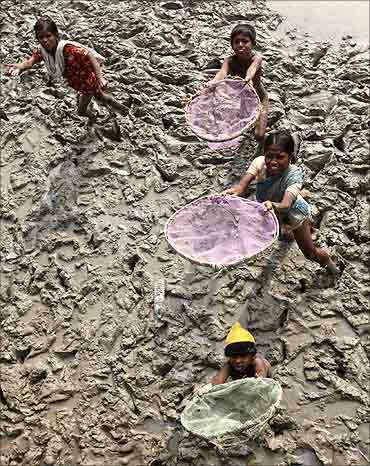 Image: Children beg for alms from pilgrims near the banks of the river Ganges. The report said that in China and India combined, the number of people living in extreme poverty between 1990 and 2005 declined by about 455 million, and an additional 320 million people are expected to join their ranks by 2015. 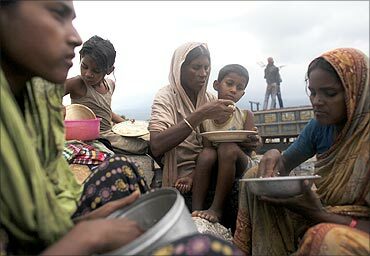 Image: Stone worker Sajeda Begum eats lunch with her son Sohel during a break in work at Bholaganj. The report examines where the world stands in terms of achieving the eight social and economic targets by 2015. The goals include eradication of extreme poverty and hunger, achieving universal primary, promoting gender equality, reducing child mortality, improving maternal health, combating HIV/AIDS, and ensuring environmental sustainability. Click NEXT to read on . 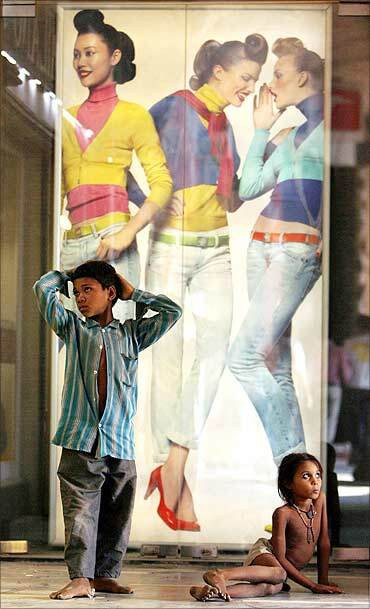 Image: Homeless children are seen in front of a display window of a garment showroom in New Delhi. The report also said that despite significant setbacks after the 2008-2009 economic crisis, the world is still on track to reach the poverty-reduction target. 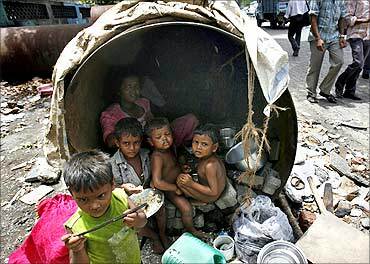 By 2015, it is now expected that the global poverty rate will fall below 15 per cent, well under the 23 per cent target. The report pointed out that despite progress, the most vulnerable sections of society were being left out. Image: Global poverty rate will fall below 15 per cent. For instance, the poorest children have made the least progress towards improved nutrition. On the health front, it said that the prevalence of tuberculosis was declining. Between 1995 and 2009, a total of 41 million tuberculosis patients were successfully treated and up to 6 million lives were saved due to effective international protocols for the treatment of tuberculosis. However, India had one of the highest number of tuberculosis cases along with China, South Africa, Nigeria and Indonesia. China and India combined accounted for 35 per centof the world's new tuberculosis cases. In environmental sustainability, the report said that forests are rapidly disappearing in South America while Asia led by China is experiencing net gains, the report said. Asia had registered a net gain of 2.2 million hectares annually in the past 10 years, mostly because of large afforestation programme in China, India and Vietnam. MUST READ! The flaw in our fight against poverty! 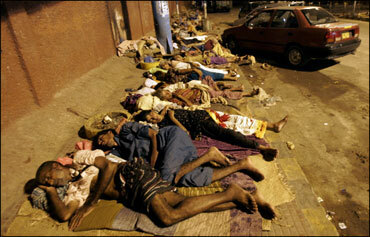 How many poor people live in India? No one knows!